2008 was the Centennial year for Australian Rugby Leagues domestic competition. 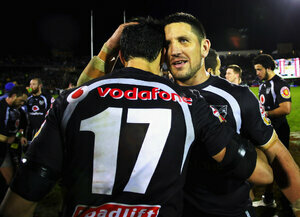 All teams jerseys across the NRL featured a special Centennial badge. 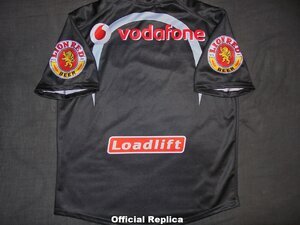 That badge was the only change on the front of the 2008 home jersey while there was a slight change to the Loadlift logo. OFFICIAL REPLICA - As with most Puma jerseys these jerseys had a larger sizing than the CCC jerseys. Sold quite well because of the Centennial year. They pop up regularly online and dont go for much. 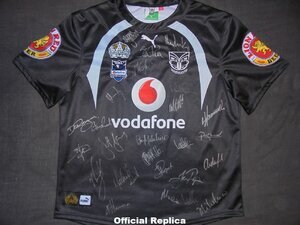 Even signed jerseys only go for around $150 or more depending on the demand. PLAYERS JERSEY - Same as the year before besides the changes mentioned above. White number on the back. Never seen one aside from match pictures. Any jersey is going to start at $200 and could go for four times as much depending on the player and whether it signed.